Baden-Württemberg is the global centre of the industry and makes AMB the exhibition in the "Key to markets"
Every second machine tool "made in Germany“ is produced in Baden-Württemberg. According to the Association of German Machine Tool Manufacturers (VDW), 47.8 percent of employees in the German machine tool industry work in this region. This is the basis on which AMB has become the leading international exhibition for machine tools and precision tools.Visitors from all over the world will come to this summit meeting of the industry in Stuttgart, the state capital of Baden-Württemberg, from 16 to 20 September 2014. The AMB slogan "Key to markets" is very apt: this exhibition is held in the area with the world's highest concentration of manufacturers. The majority of these companies, including many world market leaders and innovation leaders, will naturally exhibit at their "home exhibition." However, the target public of the exhibitors is also domiciled in southwest Germany: with more than 450 companies in Baden-Württemberg, it is Germany's autoland, the cradle of medical technology and the region with the highest turnover of the entire German mechanical engineering industry. An extraordinary concentration of manufacturing companies, component suppliers, customers and research and training institutes has turned Baden-Württemberg into this high-tech hub in Europe. The economy of the third largest German federal state (population: around 10 million) is characterised by a large number of small and medium-sized manufacturers who operate extremely successfully around the world. According to the Baden-Württemberg Ministry of Finance and Economics, 50 percent of the workforce in the mechanical engineering industry in Baden-Württemberg work in companies with fewer than 500 employees while 60 percent of companies have fewer than 100 employees. One typical medium-sized firm is Haas Schleifmaschinen GmbH from Trossingen in the southern Black Forest. The origins of the company lie in a craft enterprise from the 1930s. It has now become a globally operating company which sells its grinding machines to customers in Europa, Asia and North and South America. "AMB is a permanent date in our diary," said Thomas Bader, Director of Technology and Sales at Haas-Schleifmaschinen GmbH. "During the exhibition, we show trade visitors important innovations such as our grinding software with which a user can be differentiated from a competitor. For example by designing his own tools based on his technical concepts which in turn give his customers better cutting values and service lives during milling or drilling." Important target markets are the manufacturers of precision tools and medical technology companies which grind implants on Haas machines and rank among the strong user industries of AMB exhibitors. Precision mechanics and surface treatment are the two roots of the tool industry. Their origins lie in the watch and clock making industry, which had a long tradition in both southwest Germany and the neighbouring country of Switzerland right up to the middle of the 19th century. After the introduction of the digital watch, a large number of manufacturers used their precision skills and expertise for other industries. Motor vehicle manufacturers, automotive component suppliers, aerospace companies and medical technology enterprises profit from the high-precision tools and machines. The largest customer industry for machine tool manufacturers is the automobile industry which had a turnover of around €84 billion in Baden-Württemberg in 2012. Containing companies such as Mercedes-Benz, Porsche, Robert Bosch, Audi, Smart, ZF Friedrichshafen and Getrag, Baden-Württemberg is the centre of motor vehicle construction. In the shadow of these companies which conquered the world market, there flourished a glorious area in which craft firms grew into successful enterprises and niche players. A large proportion of trade visitors at AMB come from OEMs and suppliers who look for innovative solutions from the tool and machine tool industry for their challenges regarding electromobility, lightweight construction and new surfaces. The high quality of German products can only be maintained through high-precision tools and increasingly automated machine tools. For example, the industry manufactures around 40 percent of intermediate goods such as bearings, gear units and fittings which are supplied to manufacturers of end products. The relationships with customers from motor vehicle construction are very close and promote numerous innovations. The high concentration of flourishing customer companies is certainly one of the main reasons why tool making and mechanical engineering companies focus on the region. Users are faced with great global challenges which will also determine the exhibition programme. "Walter AG will naturally again present new high-tech metal-cutting tools and productivity solutions in order to make metal cutting even more efficient and more economical," said Mirko Merlo, CEO of the Tübingen-based company Walter AG. "This is a clear indication of our engineering expertise. We are always aware that our customers face tough worldwide competition." Established back in 1919, the company's success is based on 200 patents of its founder. Walter now employs around 4,000 people all over the world and has a presence on every continent through approximately 50 subsidiaries and sales partners. 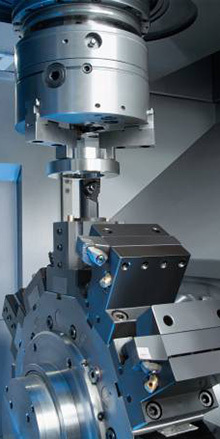 The company's brands Walter, Walter Titex, Walter Prototyp and Walter Valenite cover the entire range of metal working - lathe turning, drilling, milling and threading - and also offer with Walter Multiply a service concept for tool logistics, production, maintenance and software. milling-turning tasks, supplemented by a range of modular services for maximum availability. Founded in 1867 in Salach, EMAG is managed by the Hessbrüggen family and, since 2009, by a Chinese textile machine manufacturer on a 50% basis. The company initially started as a foundry and is now the international market leader in its special field, i.e. the manufacture of pick-up lathes. The range of products of the EMAG Group extends from standard machines through to customised solutions. At present EMAG is increasingly developing modular products and will present vertical pick-up lathes for processing chuck parts and shafts at AMB 2014. The above-mentioned exhibitors are just some of a large number of companies in the region that enjoy success far beyond the state borders and will present their innovations "made in Baden-Württemberg“ at AMB 2014. The around 90,000 visitors from home and abroad, e.g. from other German federal states, from Europe or from another continent, will all rightly feel that they are "in the key to markets." Over 90,000 trade visitors and approximately 1,300 exhibitors are expected to attend AMB 2014 from 16 to 20 September 2014. On a gross area of more than 105,000 square metres, the exhibitors will present innovations and further developments in the areas of metal-cutting processes and precision tools, but also chucking tools, CAD, CAM, CAE, software, grinding machines, handling of workpieces and tools, and measuring systems. AMB 2014 will be supported by the promotional supporters VDMA Precision Tools Association, VDMA Software Association and the Association. of German Machine Tool Manufacturers (VDW).